OSHA Outreach Training is the principal method used to train workers in the essentials of occupational safety and health in General Industry work sites. Our 100% online, 10-Hour Outreach course, covers specific OSHA standards and requirements as they apply to general industry work sites and teaches safety awareness which helps in recognizing and reducing the risks of hazards. This fully narrated and interactive training is intended for entry level workers as an orientation and covers safety and health hazards workers may face at general industry work sites. Our course puts emphasis on hazard identification, avoidance, control and prevention. 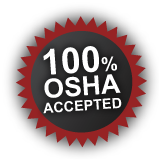 Upon successful completion of this OSHA accepted course, you will receive your 10-Hour General Industry Outreach course completion card and completion certificate.